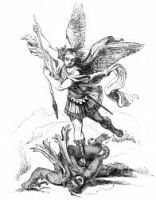 The Archangel Michael is reverenced as the first and mightiest of all created beings. He was worshipped by the Chaldeans, and the Gnostics taught that he was the leader of the seven angels who created the universe. After the Captivity, the Hebrews regarded him as all that is implied by the Prophet Daniel when he says, "Michael, the great prince which standeth for the children of they people." 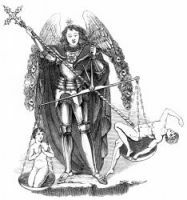 It is believed that the Archangel Michael will be privileged to exalt the banner of the Cross on the Judgment Day, and to command the trumpet of the archangel to sound; it is on account of these offices that he is called the "Bannerer of Heaven." This collection of images of the Archangel Michael are from my collection of antique Bible books. 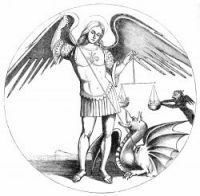 Feel free to use these pictures of the Archangel Michael in your artwork. 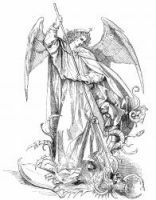 Click on the Archangel Michael illustrations below to see more details about saving a free Archangel Michael image or about purchasing the images of the Archangel Michael at a higher resolution.